Coppermill Lane, Walthamstow, London E17. With Global Street Art and Forest Recycling Project for Colour the Capital. 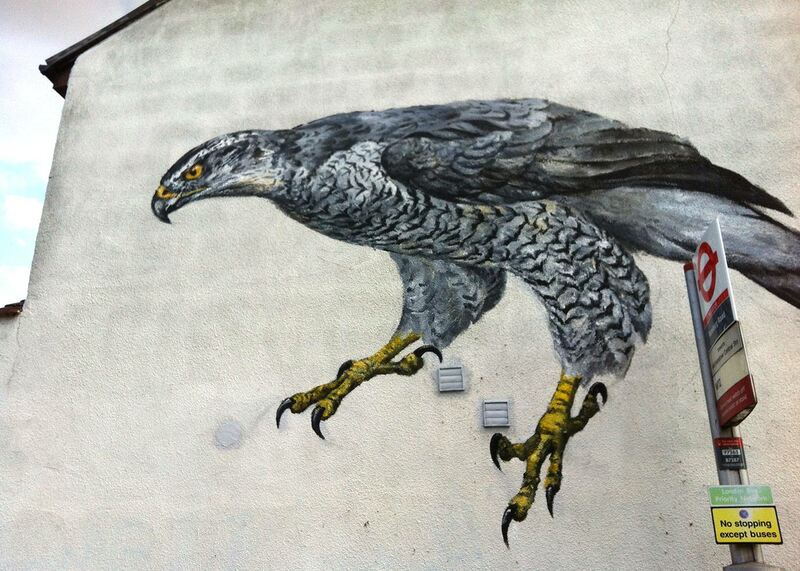 I painted this goshawk near Walthamstow marshes in London, with Global Street Art and Forest Recycling Project, for Colour The Capital. Goshawks once lived here and no doubt could again as there is space enough and plentiful food. Goshawks live in Berlin, so why not London and the outskirts of other British cities? Goshawks are persecuted by gamekeepers because they take a few pheasants, but they also hunt many other species, including crows, magpies, pigeons and rabbits, whose proliferation can be detrimental to other species. The presence of goshawks can benefit smaller birds by redressing the balance in favour of those species that are preyed upon or out-competed for food by species whose abundance is not regulated by predators. The reintroduction or return of raptors can have dramatic effects on the whole structure, balance and healthy functioning of an entire ecosystem. Birds and animals by their behaviour, over time mould their environment, including its vegetation and other features. They create effects of a subtlety and significance not immediately obvious or predictable. Raptors, like all top predators, are important for complete and healthy ecosystems. They cannot be excluded without significant imbalance for the whole web of interconnected species of plants and animals. Witness the ‘Yellowstone effect’, whereby the reintroduction of wolves into Yellowstone National Park after an absence of 100 years had the effect, among others, of improving river flow and pronghorn antelope numbers. This was because their main prey, the elk, changed their behaviour to avoid grazing on the riverbanks where they were more vulnerable, thus allowing the regeneration of riverbank trees, which consolidated the banks, reducing silt runoff and therefore improving water quality for spawning salmon. Pronghorn numbers increased because wolves kill coyotes which prey on baby pronghorns, which the wolves don’t bother with because they’re too small. Who knows what effect a large and healthy goshawk population might have on our ecosystem and the numbers and health of other species of birds and mammals. The presence of top predators can, counter-intuitively, lead to an increase in species’ numbers lower down the food chain because the whole system is more balanced.